I think it’s worthwhile to attend the upcoming Summer School being held by The Computer Society of Zimbabwe. 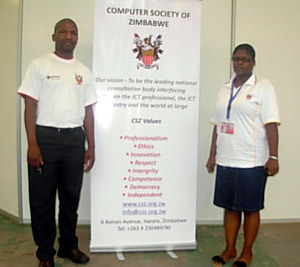 The Computer Society of Zimbabwe (CSZ) is the largest professional association for computer practitioners in Zimbabwe. CSZ’s summer school is a conference that is held annually and last year’s Summer School was primarily about the role of Information Communication and Technology in Zimbabwe to help in achieving Sustainable Development Goals. This year’s conference themed “Everything ICT- The Digital Age & Cyber Security” will be centered on the implications of technological disruption that is being brought about by a number of technologies such as blockchain, data analytics etc. Disruption is the new reality faced by entities and opportunities are limitless. The innovation of ICT technological trends and automation have been progressing exponentially more so in the last decade. Every business today is a technology driven organization, hence the paradox for continuous innovation and for some entities, playing catch up in the new technological frontier. The challenge for entities is how does organizations rise above the noise, challenge the convention and remain relevant in this digital age. Digital Disruption is therefore the new revolution where opportunities remain limitless for organizations in attaining their vision and goals. Notable trends in technology of Cloud, Big Data, Analytics, Internet of Things, Social media technologies and Artificial Intelligence, to mention but a few, cannot be ignored by entities as they are having an impact in the way business is run. In addition, the cyber security trends and events of yester year such as Ransomware and data loss are impacting and remain critical in automation and data protection. This year Summer School 2018 Conference seeks to delve on the developments in ICTs and their applicability in the day to day operations. Inclusively not to be ignored is the exponential technologies and trends that are transformational in nature in dealing with the relevant challenges and opportunities. Exchange will also focus on the recent major innovations on offer that have implications on industry and society in general. The applicability and adoption strategies of the innovations becomes of paramount importance for organizations.